Next year the Middle School will be moving away from block scheduling and back to a 7 period day!! Students are going to have more flexibility within their schedules and a lot of opportunities for electives including Middle School athletics being moved back to 1st hour and the beginning of the day!! Canadian Valley Career Tech Nursing Program donated 1250 pieces of candy to BWECC Annual Egg Hunt this year as a class project. We welcomed a new addition to the Grand family- Debbie Bradford. We are excited and looking forward to getting to know her. Grand 3rd & 4th graders finished up testing. Our students came prepared and ready to tackle the test.Our 2nd graders did awesome job supporting our testers- they were quiet and provided little pick me ups each day. 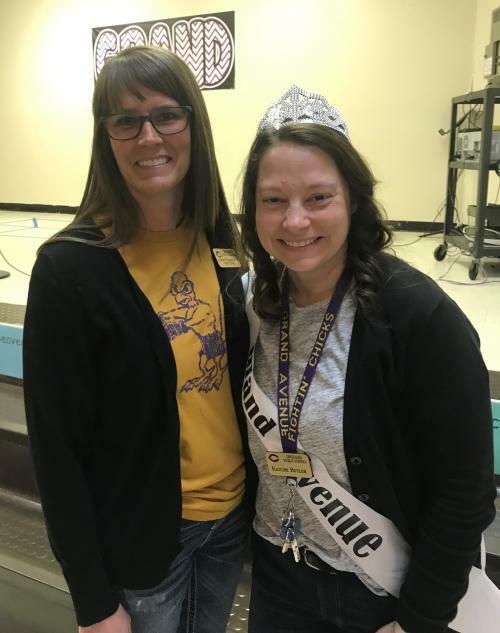 💜 Grand could not be more excited & proud to have our very own Ms. Raylee Butler as Chickasha’s District Teacher of the Year! We are thrilled for our community to celebrate what we already knew- she is beyond amazing! Recently, Middle School boys competed in the State Powerlifting competition. Congrats to Kayson Paukei, 7th grade champion in 123 weight class; also nominated for MVP among lightweights for a 320 lb deadlift! Ty Rayburn, 8th grade State Champion in the 220 lb class! Malachi Paukei, 9th grade State Champion in the 198 lb class! Others finished in 3rd, 4th and 5th places! Congratulations, guys! We are proud of you! Grand Elementary's 4th grade students were invited to listen to the Irish group Goitse at USAO. They enjoyed the Irish traditional tunes that were played by many different instruments. It was a great way to start an early St. Patrick's Day celebration. Grand Elementary just purchased a new piece of playground equipment with money donated from several community businesses! It will be installed in June with a ribbon cutting ceremony after school begins next year. Carrie Chavers, our very own High School art teacher and business owner, will be featured in the Chickasha Chamber Facebook video "Successful Women Series". Carrie was also recently accepted into the exclusive Kansas City Art Institute's Summer Program, ArtLab. Only 20 applicants are accepted and she is one of them!! Congratulations! CMS Cheerleaders received STATE RUNNERS -UP by only 1 point! Way to go girls! We are so proud of you! Mrs. Raylee Butler received thundering applause as she was recognized as the 2018-2019 District Teacher of the Year. Superintendent, Dr. Jack Herron, announced the honor, as all Grand teachers, staff, students, and the Chickasha Fightin’ Chick mascot celebrated. Mrs. Butler was serenaded by CHS Steppin’ Out. Mrs. Butler, leads the L.E.D. program at Grand Avenue Elementary, where she has taught for the past six years. Raylee built the L.E.D. program to engage students whose behavioral needs challenge their ability to learn in the traditional classroom setting. She is committed to making a difference in the lives of her students through tailoring the learning environment to suit their individual needs. Prior to teaching in Chickasha Public Schools, Raylee was instrumental in the development of Edmond Public Schools’ first autism-exclusive high school classroom at Edmond Memorial High School. Raylee has a degree in Special Education from the University of Central Oklahoma. The true joy of Raylee’s life is her family. She and her husband Michael have been married for eighteen years. When she is not teaching, you can find Raylee busy in the ministry of First Baptist Church, where her husband Michael is the pastor. The Butlers have four children in Chickasha Public Schools—Pike, a freshman at CHS, Emery, a sixth-grader at Lincoln, Lindy Kate, a fifth-grader at Lincoln, and Nixon, a second-grader at Grand. Mrs. Butler will represent the school district in the Oklahoma Teacher of the Year selection.